Linkinhorne (Cornish Lanngynhorn) is a civil parish and village in southeast Cornwall, lying approximately four miles northwest of Callington and seven miles south of Launceston. The proper name of this parish is Lankinhorne, which signifies” a church of iron,” or as Bannister states,” the church in the corner.” In the Chantry Rolls the name is Lankynhorne. Linkinborne, however, is most probably derived from Llan Tighern ‘the church of the king’, that is, of St. Melor or Milorus, to whom it is dedicated. 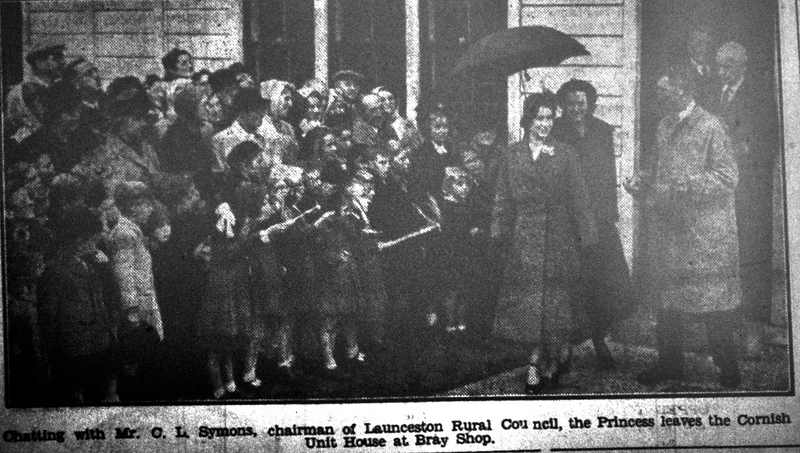 As well as Linkinhorne itself, other settlements in the parish include Bray Shop, Caradon Town, Downgate, Henwood, Ley Mill, Minions, Plushabridge, Rilla Mill and Upton Cross. The area is bordered by the River Inny in the north-east and Bodmin Moor to the west. The valley of the River Lynher runs through the parish. . 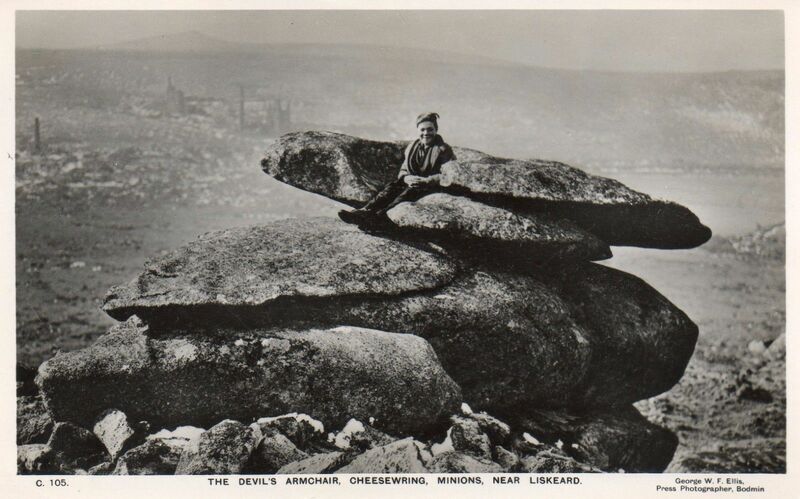 This parish rests on granite, forming high and barren hills, the sides and summits of which are covered with immense boulders and tons of granite which once furnished employment for a great number of stone-cutters. As a mining district, the western part of this parish is similar to St Cleer to which it adjoins. Tin mining and streaming was being worked here from the mid-17th century. 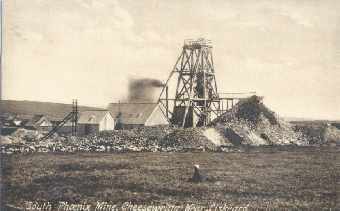 The Phoenix and West Phoenix mines are 3 miles west of the village of Minions and 6 north of Liskeard. 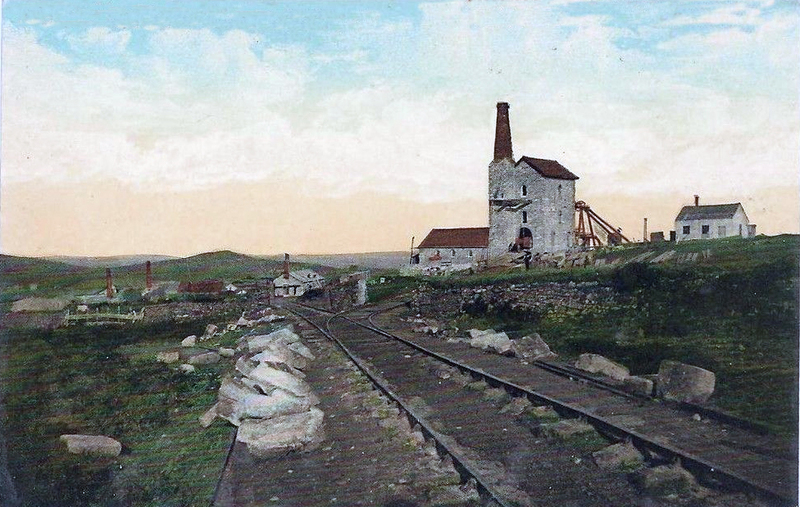 The mine was first worked under the name Wheal Prosper in the 1836 when it was part of Cornwall Great United Mines. This venture was unsuccessful, but later exploration found ore in quantity. Between 1848 and 1889 Phoenix United had produced 84,538 tons of copper and between 1853-1898 15,996 tons of tin. 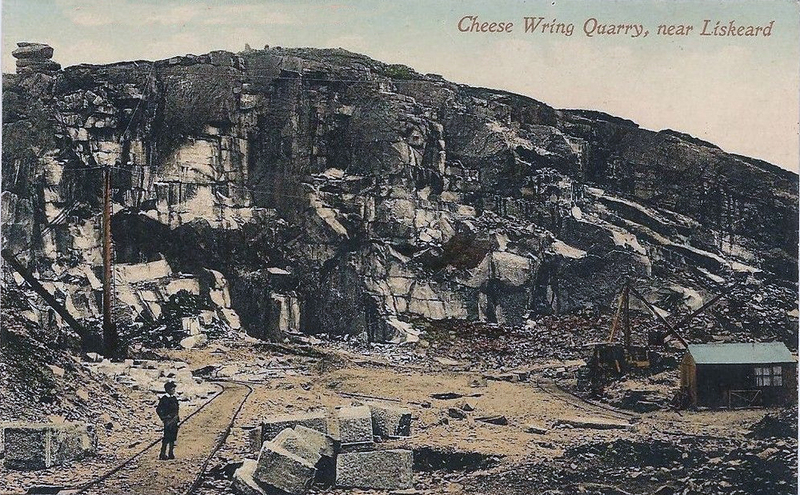 The famous Cheesewring Quarry was started in 1845 although Granite working on the moor had been established for centuries previously. 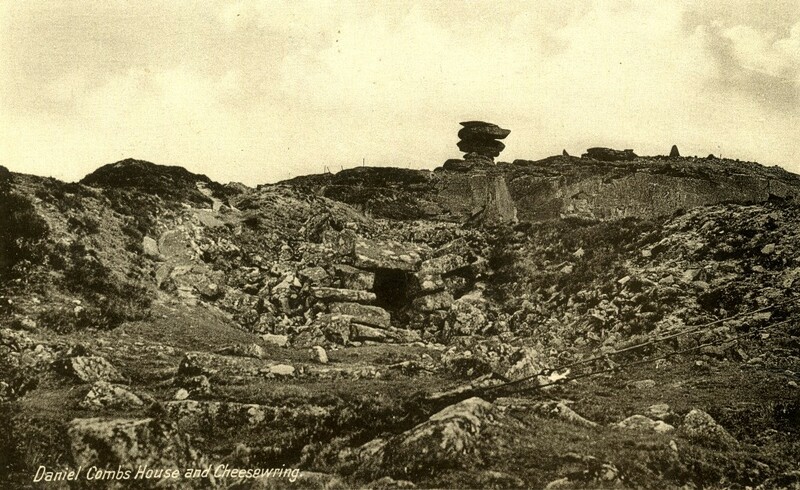 The quarry produced the stone setts for the Liskeard and Caradon Railway. 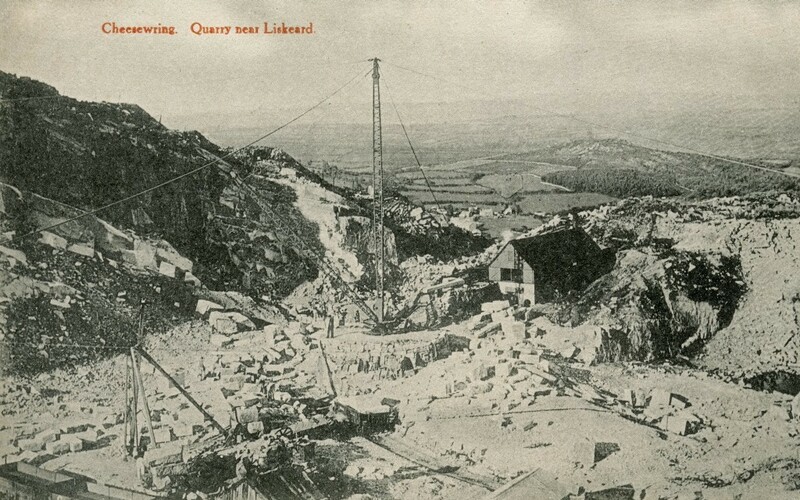 All major working in the quarry faded away during the early part of the 20th Century. Linkinhorne parish is within the Deanery and Hundred of East and is bounded on the north by North Hill and Lezant, on the east by Stoke Climsland and South Hill, on the south and west by St. Ive and St. Cleer. The name Linkinhorne means church site (Lann) of Kenhoarn. 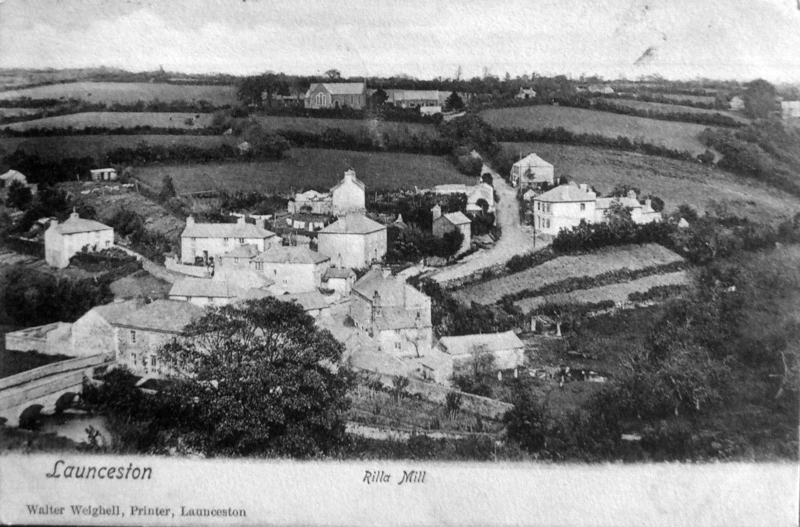 In the Domesday Book, the manor is referred to as Resleston (town by the ford) (Rillaton). This manor was once the head manor of the Hundred of East and one of the 17 Antiqua maneria of the Duchy of Cornwall. At Darley Farm ( ( Darleyford Cornish: Rys Dowr Legh, meaning ford of the rock slab river) is the Darley Oak which is believed to be over a thousand years old and has a circumference of 36 feet. In medieval times there were chapels at Trefrize and Caradon. 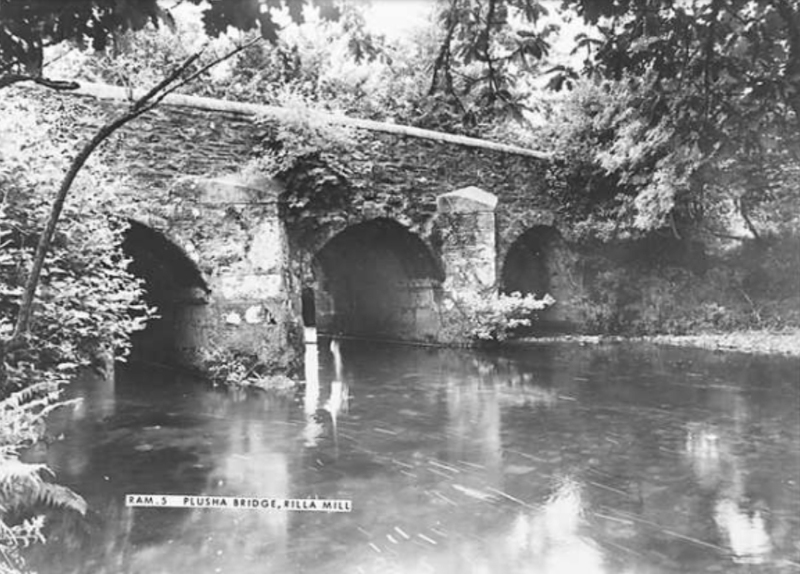 Also in the parish are the Holy Well of St Melor; a 15th-century bridge over the Lynher at Plushabridge; and near Minions the Rillaton round barrow (in which Bronze Age grave goods, including a gold beaker, were discovered in 1837). Rillaton Barrow was excavated in 1837 and found to contain a centrally-placed inhumation beneath the 25m wide barrow. The burial had been placed in a stone cist measuring 2m by almost 1m. Human remains were found along with grave goods including the Rillaton Gold Cup, a bronze dagger, beads, pottery, glass and other items. 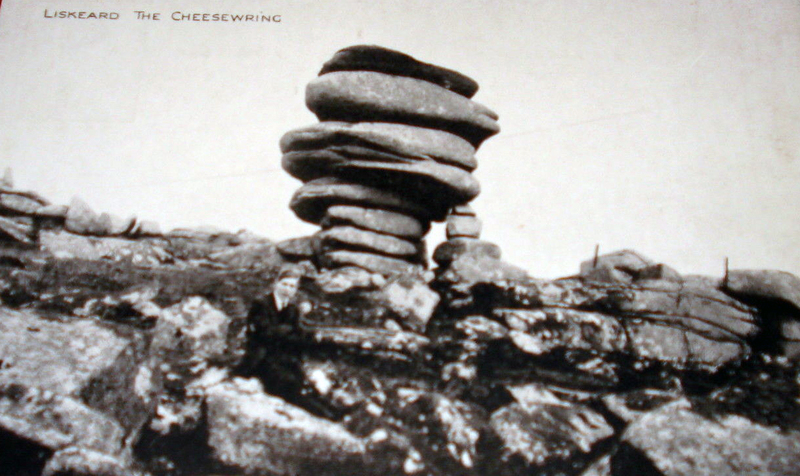 The remarkable pile of stones called the Cheesewring, or Wringcheese- so-called because they rest upon each other cheese fashion – is situated on the common called Stowes. They comprise a large mass of granite rock of 22 feet high. These stones overhang their base so much that the wonder is how they sustain their position. This place is an object of great interest to the tourist, and is a natural curiosity. 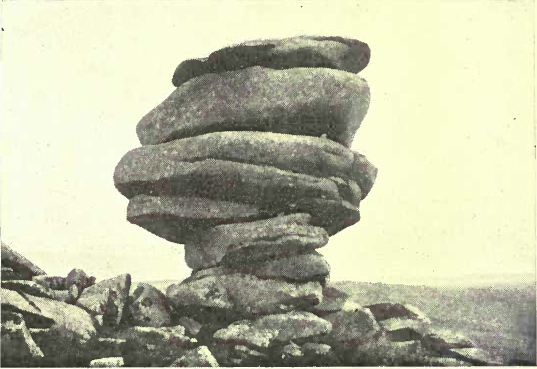 The stones, 10 in number, are at the broadest place on the top about 34 f t in diameter, and the narrowest part of the base about 17 feet. 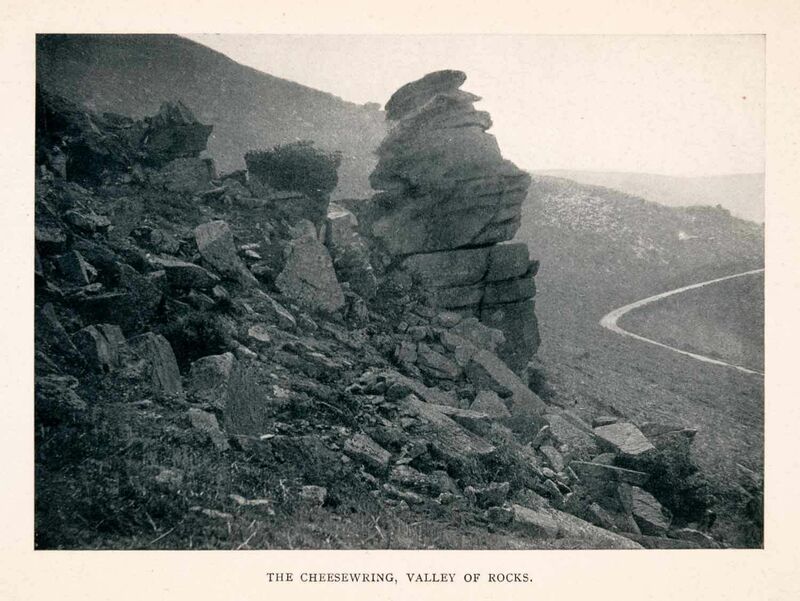 Within a mile to the northward of the Cheesewring stands another extraordinary assemblage of rocks, termed- from their conical arrangement- Sharp Point Tor. Its elevation is 1200 feet above the sea, and the panoramic scenery is very, fine. This with Kilmar is the highest points in the district of East Cornwall. 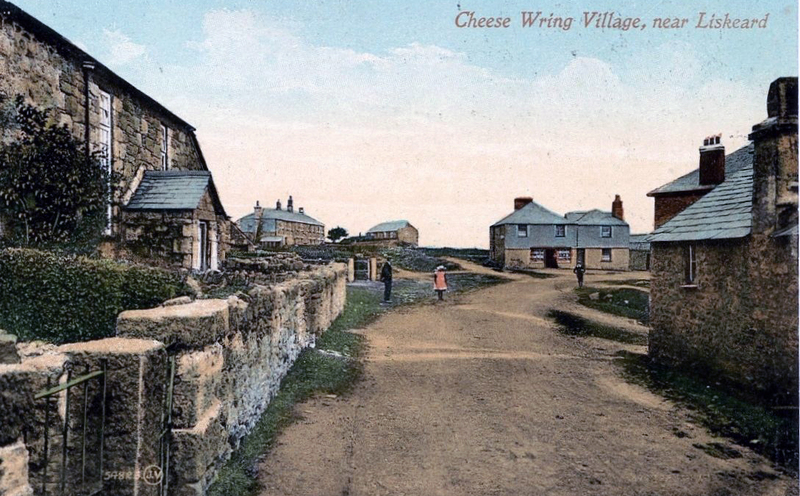 At the top of Stowes near the Cheesewring is a level place, about three-quarters of an acre of land enclosed with a stone hedge, supposed to be once very strong, It was the Manor Pound to impound goods in the manor of Rillaton ; and is called Stow’s Pound to this day. The Hurlers are a group of three stone circles near Minions (below) ranging in diameter from 108 feet to 140 feet, and dating from about 1500 BC. Legend has it that St. Cleer found some local men playing hurling on a Sunday, and refusing St Cleer’s demands that they stop playing and go to church. 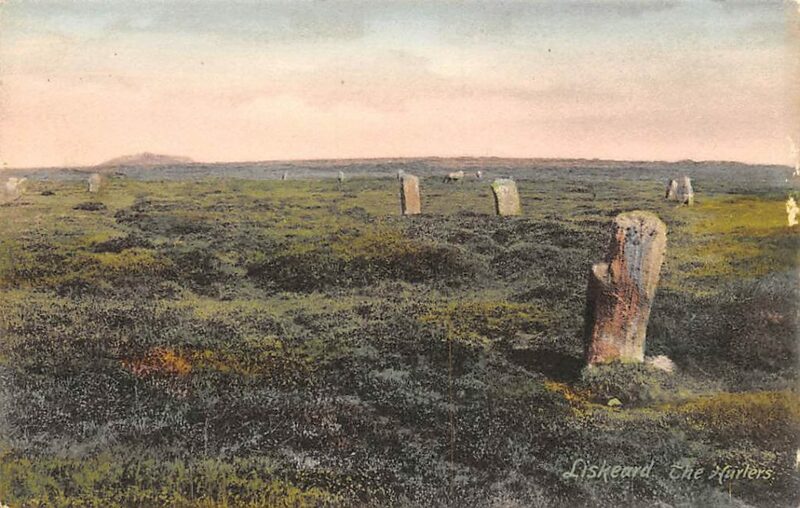 St Cleer was so angered by their refusal, that he turned them to stone to play hurling forever on the Moor. Their original purpose was probably something to do with the druids. The mother church of the parish is that of St Melor at Linkinhorne. The church is built of granite and dates from the 15th century. The tower is 120 ft high and is buttressed on the square, and is finished with battlements, battlemented turrets and crocketed pinnacles. There are six bells which were cast in 1805 by the Penningtons of Stoke Climsland. The interesting features of the church include a medieval altar slab, the 13th century font and 15th century wall paintings. The north aisle and lofty tower are said to have been built at the expense of Sir Henry Trecarrel. The church comprises a chancel, nave and north and south aisles. The arcades each comprise five four-centred arches of granite, supported on monolith pillars of the same material. At the west end of the church the arcades are banded together with iron bars on which stands the date 1786. The tower arch, which is well-proportioned and moulded, is blocked. The church was given to Launceston Priory by Reginald Fitz-Henry, Earl of Cornwall, the natural son of Henry I; the gift was confirmed in a charter from King John in 1199 and by another from Henry III in 1288. The rood stairs remain in the north wall. The Font has a square basin, supported on a central pillar with smaller ones at the corners, and is probably Norman. An ancient altar stone, incised with crosses, has been laid in the vestry floor since April 14th, 1891. The chalice, with cover, dates from 1572, and the paten from 1735. The register dates from the year 1576. 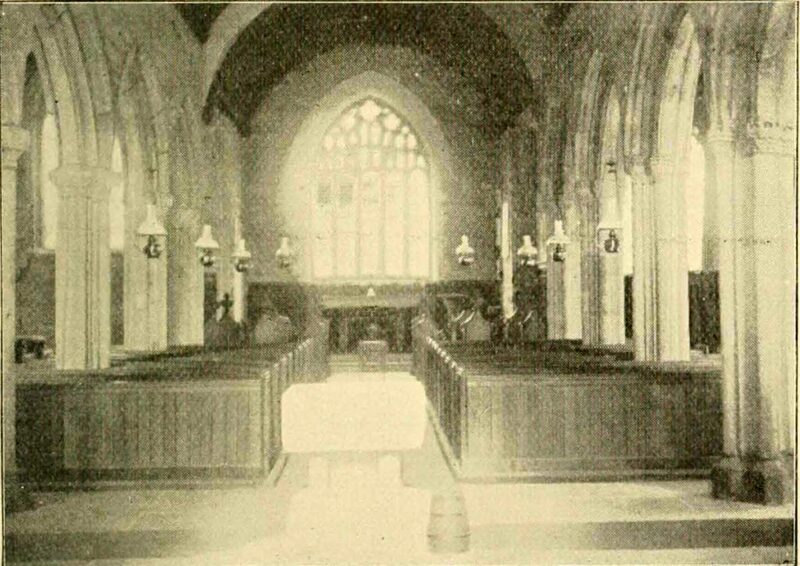 The church was restored, April 14th, 1891, at a cost of £ 1 ,2 14 during the vicarage of the Rev.W . H. Poland. During the restoration wall paintings were revealed in the south aisle showing the Seven Corporeal Works of Mercy with Christ under a canopy and fragments of what are thought to be the Seven Deadly Sins. LINKINHORNE CHURCH, CORNWALL. An Interesting Discovery. The restoration of this church, which has been undertaken by the vicar, the Rev WH Poland, and a committee of parishioners, is making satisfactory progress under the direction of Messrs Hine & Odgers, the architects, and it is hoped the work will be completed in October. A few months ago the interior of the building presented a most desolate and unpromising appearance, with walls, roofs, pillars, and arches covered with white-wash, and scarcely a fragment of carved work of colour to relieve the dreary waste. Since then all the white lime has been removed and the masonry cleaned, repaired, and pointed. Here, as in so many churches of Cornwall and Devon, it is found that the earlier work is in freestone, and the latter in granite. The south aisle, erected about 1380, is built in the easily-worked local stone of Pengelly; the north aisle and tower, erected by Henry Trecarrel early in the 16th century, are of granite, chiefly in large blocks. The figure of Our Lord, under a canopy or tent, against a diapered background, is fully outlined. He is represented with a nimbus [enclosing a cross] surrounding His head, and with wounded side, hands, and feet. His bleeding hands are uplifted as if in blessing [”Ye have done it unto Me,”] and the symbolical treatment of the subject throughout is of much interest. The fresco [for such, no doubt, it is, although executed on only a thin coat of plaster, and in a manner very different to Italian frescoes], is probably only one of a series which occupied the spaces between the door and window openings of the south aisle, indeed further west is a portion of another painting, the subject of which has not yet been made out, and which was covered by the past Reformation lettering alluded to. The words “King James” probably fix the exact period of this later treatment. There can be little doubt that the frescoes are of the same date as the aisle itself [Circa 1380], and that they are on the original plastered surface of the masonry. The usual plastering of that time was a mere skim. In this case it is nowhere more than a quarter of an inch thick, including an undercoat of sand and lime to make up any unevenness of surface in the wall. Over this is a thin coat of almost pure carbonate of lime, on which the artist must have worked. The colours he used were chiefly earths – red ochre, siena, green, and copper. It is not a little striking that besides the fabric itself, the only remains of mediaeval art left in this church are a head of the Saviour in the glazing of a window which is in the line of the Rood, and close by this remarkable and beautiful fresco, with its lesson which Shakespeare re-echoes in the “Merchant of Venice” – “In the course of justice none of us should see salvation. We do pray for mercy; and that same prayer doth teach us all to render the deeds of mercy”. It is almost needless to say that the remarkable “find” at Linkinhorne will be most carefully protected from injury. Quite a history if written on the south wall of the church. It tells of the teaching by pictures by the church in the Middle Ages; of the teaching by the literal words of Scripture by the Church of the Reformation; the numberless coats of whitewash over both speak of subsequent ages of neglect and indifference; and may not the restored fabric typify the awakened Church in Cornwall of the nineteenth century? A few hundred yards down the hill from the parish church water seeps out of the ground to form a sacred pool. The well (below), like the church, is dedicated to St Melor, and like the church, the well-head protecting the pool dates to the 15th century. 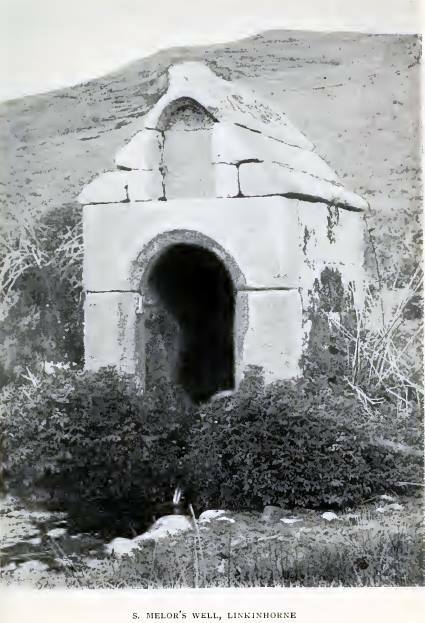 A large niche over the well entrance looks as though it once held a statue of a saint. The well water was traditionally thought to help cure sprained legs in horses. It was also used for baptismal water in church services. In 1885, with the population increasing in the mining villages, the decision was taken to build another church at Upton Cross. 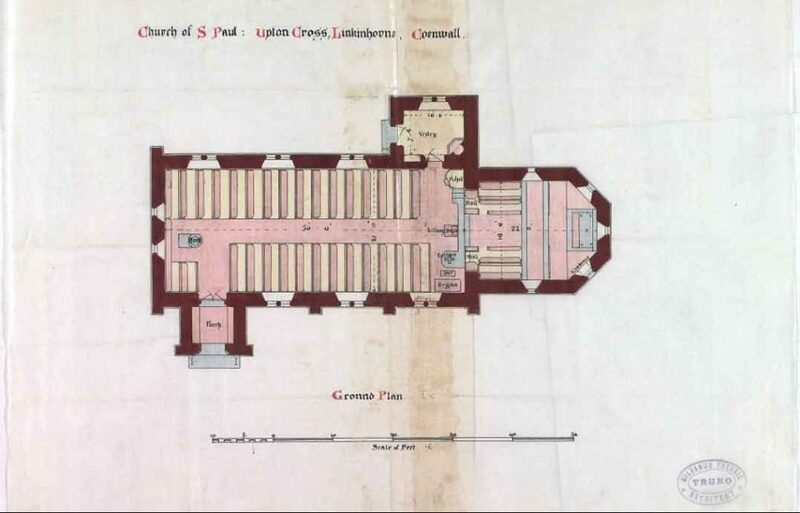 The land was donated by the Duchy of Cornwall and the church was designed by Mr Silvanus Trevail of Truro and constructed by Mr Trehane of Liskeard for the sum of £1,525. At the same time the Sunday School building was constructed for just over £200 and was designed to accommodate about 70 or 80 scholars. The Board School, which was finished before the Church was designed by the same architect! The church was designed for a congregation of around 200 and has a nave 50 feet long by 21 feet, with a chancel 22 feet by 16 feet with an apsidal end. A graceful granite arch divides the chancel from the nave and the woodwork of the roof is open with arch ribbed principals. A western bell cote was built containing one bell. Hot air heating was installed when the church was built. St Paul’s church was consecrated on the 2nd May 1887. Minions. The chapel was built in 1864 and it closed in 1980; it is now a private dwelling. Henwood. This chapel was built 1855 and closed in 1980. It is now a private dwelling. Higher Stanbear. (Bible Christian). There is no further information available. The building has been demolished. Upton Cross. (Wesleyan Methodist), was built 1864 and closed early 1980s; it is now in use as a storeroom. Lanhargy. (Wesleyan Methodist). The present chapel was built in 1911 to replace an earlier building from 1802. The building is now semi-derelict. There is a burial ground attached. Caradon. (United Methodist Free Church). 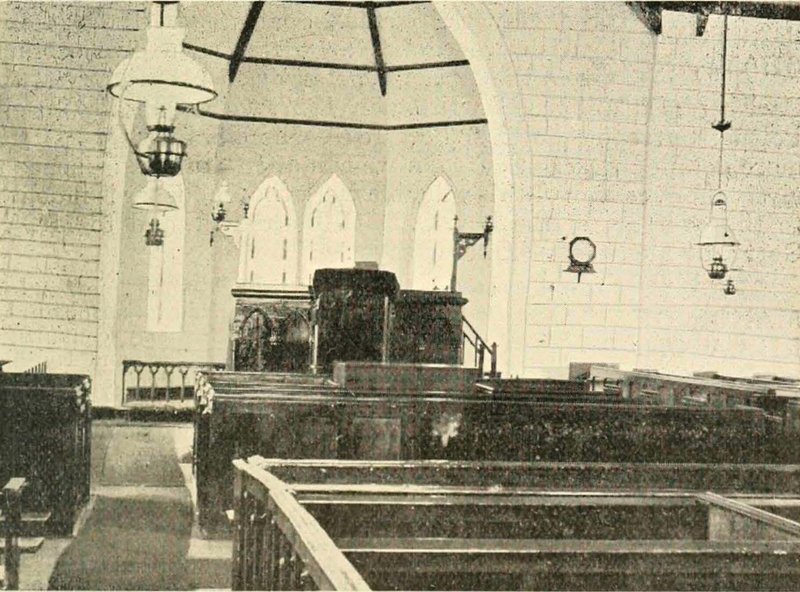 This chapel was in use until the late 1920s and was then demolished. Plushabridge. (Plymouth Brethren). The chapel was built at the end of the 19th century and closed down during or after WWII; it is now a private dwelling. Darley. (United Methodist Free Church). The baptism registers date from 1837 to 1907. It was no longer a chapel in the 1960s and in the 1970s was converted to a dwelling. There are some monumental stones still in existence. Rilla Mill. (Wesleyan Methodist). 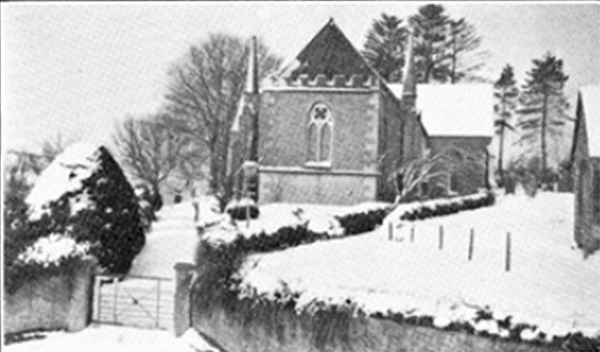 The present chapel was built in 1846 and is still in use today; there is an adjacent burial ground. Bray Shop. (Bible Christian). This chapel is still in use at the beginning of the 21st century, and has a small burial ground attached. The following is taken from the 1900 Vennings directory. Methodism was first introduced into this parish in the year 1767, when the first Methodist sermon. was preached by Mr. Cotty, in the house of Mr. John Nicolls, farmer, Trelabe. For a long time the congregation did not exceed 14, being chiefly the members of Mr. Nicolls’ family and servants. A Society Class was formed, which met every Sunday in the kitchen. George Brimmell, a labourer on the farm, was the leader, and was a very devoted man. 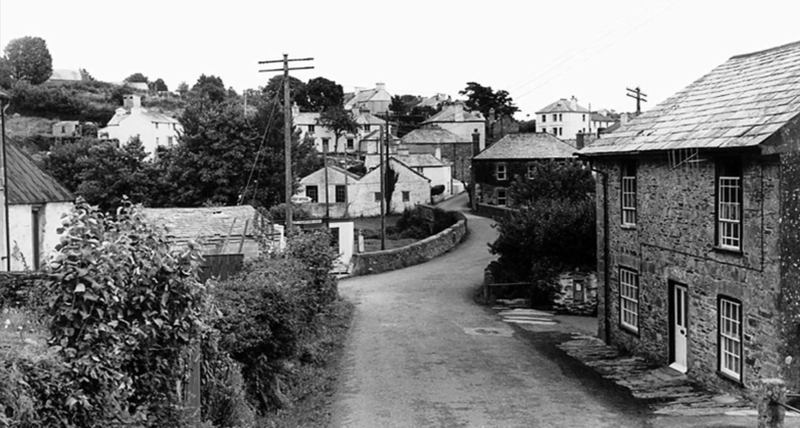 Shortly after Mr. and Mrs. John Body, who were both converted in early life, joined the Methodist Society at Trelabe. 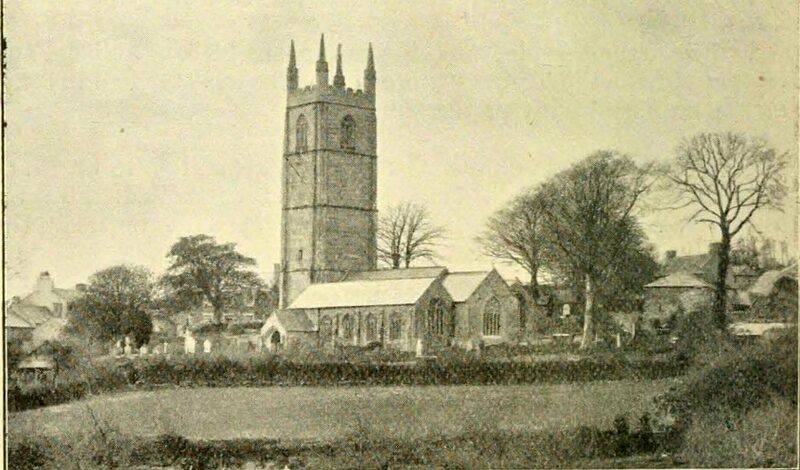 Here it was, too, that Thomas Denner was converted when 60 years of age, who lived at Frogwell , Callington, and gave the little estate there containing a house and 6 acres of land to the Methodist Connexion, an account of which is given in connection with the introduction of Methodism into the Callington Circuit. 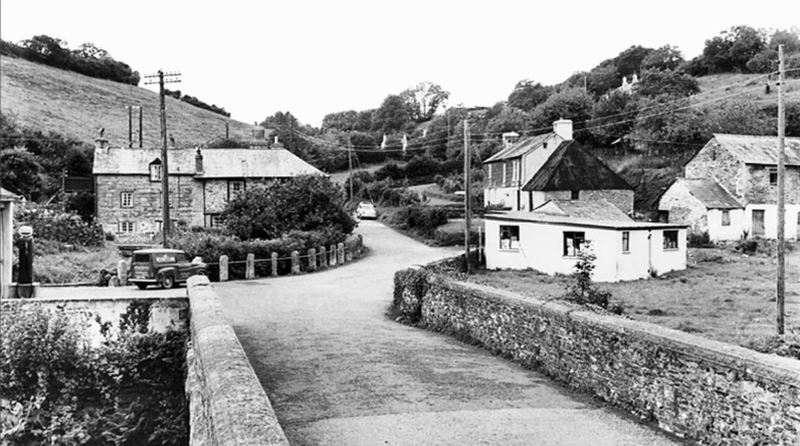 He commenced to attend preaching services at Trelabe five miles from his home, and afterwards opened his house at Frogwell to the Methodist preachers. of God; conversions were numerous and the Church was strengthened. It was during his residence in this Circuit that Adam Clarke revoked a vow he had made three years before; which was never to meddle with Latin or Greek as long as he lived. He here learnt that such a vow was sinful, and began with renewed purpose his classical studies, and laid the foundation of knowledge amidst the constant itinerating work of the Dock Circuit, that afterward made him the renowned Linguist and Commentator. 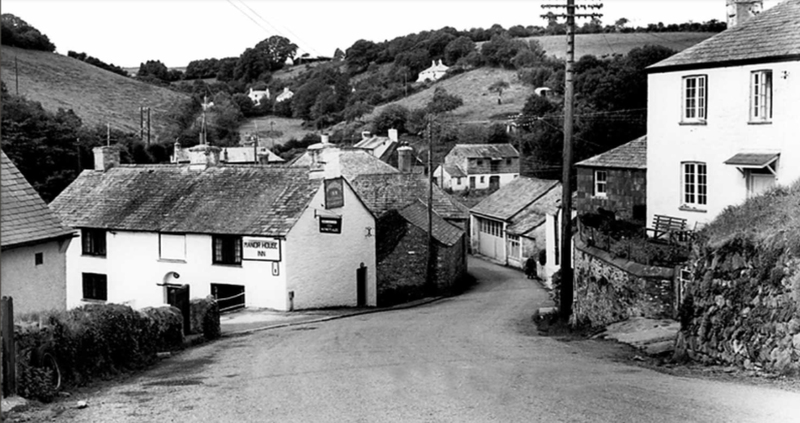 In 1785 when Adam Clarke was on his way from Liskeard to Launceston, at Botternell, he met a farmer called John Nile, and obtained his consent to preach in his house. The neighbours were called in, and as a result souls were saved and a Society formed. Nile himself was not converted at that service, but was so deeply wrought upon, that sleep departed from him. He arose from his bed and walked over his farm during the night, and prayed the Lord to forgive his sins. Presently he approached the turnip field, and there he saw a figure stooping down on the ground. He watched a moment and then discovered it was a man stealing his turnips, and putting them in a sack. Mounting the hedge he cried; “Hallo there! what are ee about?” The man perceiving that he was caught, cried out” Oh maaster! do ee forgive me; forgive me this once, maaster .” “Forgive ee!” Said Nile drawing near to the man,”Why that’s what I want the Lord to do for me, I want the Lord to forgive me, and I must forgive thee.” In that moment he obtained the blessing. He forgave his brother and his Heavenly Father also forgave him. Then said he, lifting up the sack on the man’s head, “Take the turnips and go home with mun, but dont ee steal any more. If ee want any again come to me, and I’ll give mun to ee.” John Nile’s house was always open to the Methodist Preachers, and henceforth Butternell appeared on the Dock Plan as a preaching place. 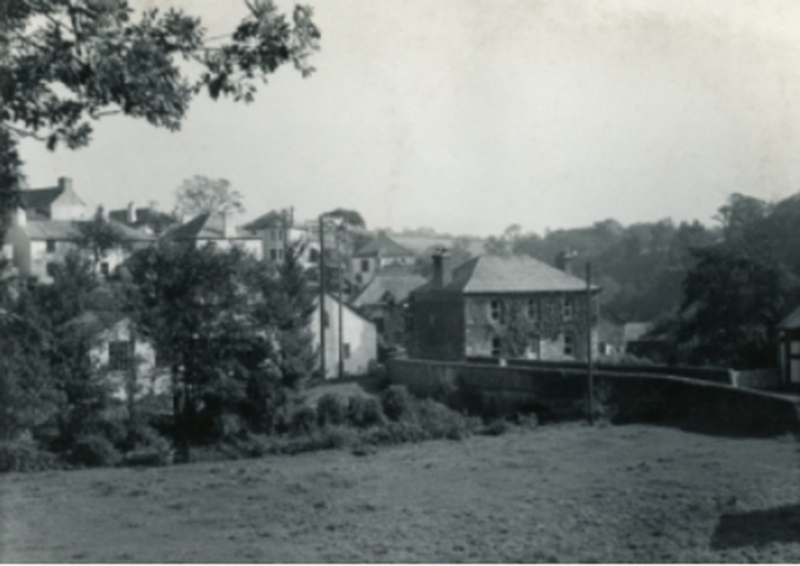 Services were held once a fortnight on the Sunday afternoon, and the members met in Class on Sunday morning, under the leadership of George Brimmell, of Trelabe. Uncle Will Downing thus passed away at a ripe old age, having been a Methodist for nearly 70 years. Burial Ground, and a neat and commodious chapel-keeper’s House was erected thereon, at a cost of about ,£200. ” In this parish is also the whole Manor of Carneadon-lier, the inheritance of Sir John Trelawny, BaronEt, son and heir of the late deceased Reverend Jonathan, Lord Bishop of Winchester, having several free tenants, who owe certain rents and suits of Court to the said Manor; and these Manors aforesaid may be said to contain the whole parish.”- Harvey, 1727. 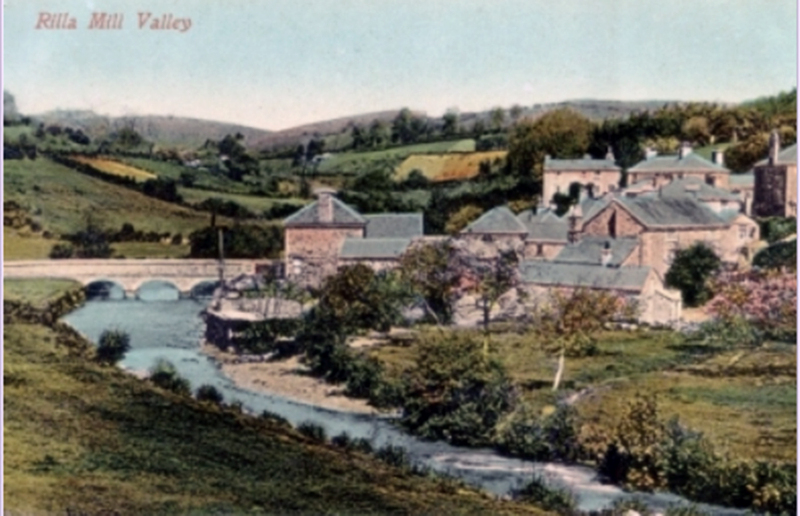 The site of the ruin of the great house and chapel referred to by Harvey as being built by Lord Trefry, now belongs to Mrs. Steven, of Trefrize, and the Holy Well is on land belonging to Mrs. Youlden (both owners in 1900). Browda has been in the possession of the Kittows for several hundred years. In 1602 th present house was built by Richard Kittow. 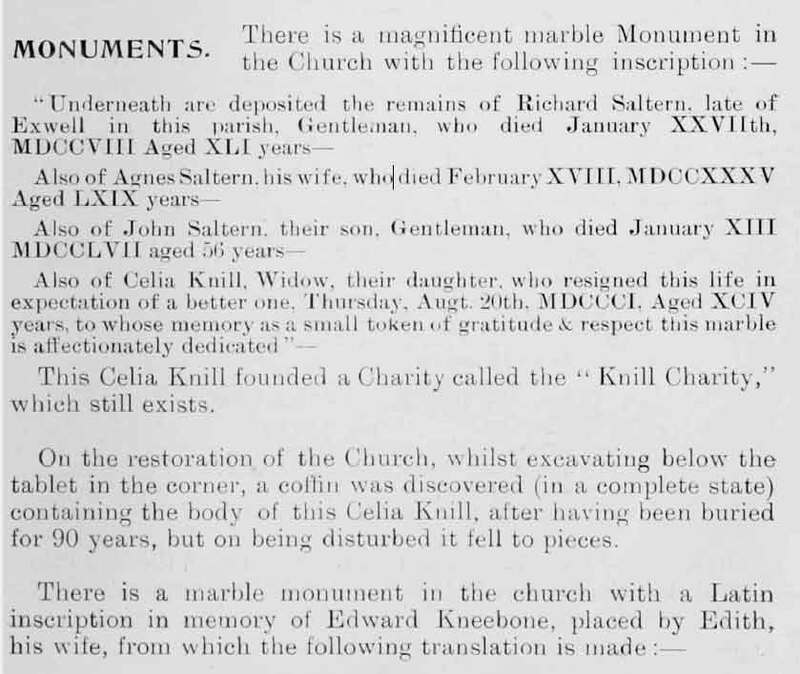 ancestor of the late Thomas Kittow, who was purser of the well known South Caradon mine for more than 40 years, and died December 31st, 1886, in his 101st year. After his death this estate came to his grand nephew, John Kittow. The date 1602 with the initial R.E. may still be seen on the carved wainscoting of the hall. Ancient pieces of plate bearing his initials and the dates are still preserved. The porch, hall and dining-room are the only parts remaining of the 1602 building. After an uninterrupted possession for many generations this estate was carried in marriage by an heiress to the Congdons, who held it for a short period, when it again lapsed to the heirs of the original proprietors, the Kittows. 1685 Jacobi Tillie Equitis Aurati. 1695 Reedified By Sr James Tillie. Tout Lieu ou je fMe troue. * Bien Cest Ma Patrie. Westcott in 1901, was the property of Mr. William Daniel. It formerly belonged, with Higher and Lower Rillaton, to Mr. R. Bate, of Bridgwater, who purchased it from the Foots. This place was for many years the property and residence of the Kneebone family, of which was Edward Kneebone, who left a MS. “History of the Hundred of East,” wherein is given a descriptive account of the Parish of Linkinhorne in his time. He died in 1685, and was buried in Linkinhorne church. Here follows brief accounts of some of the ancient estates in Linkinhorne parish as described by Harvey in 1727, and Polsue in 1876 . “DARLEY.- In the plaisance of the villa stands the great natural curiosity popularly known as the Darley Oak.’ At the height of about three feet from the ground, it measures thirty-six feet in circumference; being hollow, and having convenient openings for ingress and egress, it is capable of housing small pleasure parties, which it often does in the season. Although it is reasonably supposed to be upwards of 500 years old, it is still healthful and vigorous, annually making shoots and producing acorns .”-Polsue’s Notes, 1876. This estate of Darley, which was originally owned by a family of the same name, had been in the possession of the Dingle family for upwards of 400 year, and in 1901 still belonged to a gentleman of that name John Williams Dingle, Esq., J.P. and C.A. (below). He and his ancestors had resided here for many generations. Those who have seen this Waterfall referred to by Harvey, say that it is a large stream of water in ,the winter time, and falls almost perpendicular for about 50 teet, and it makes a deafening noise, but it is a most difficult place of access. The land belongs to the Duchy and in 1901 was occupied by Mr. Jas. Sargent. 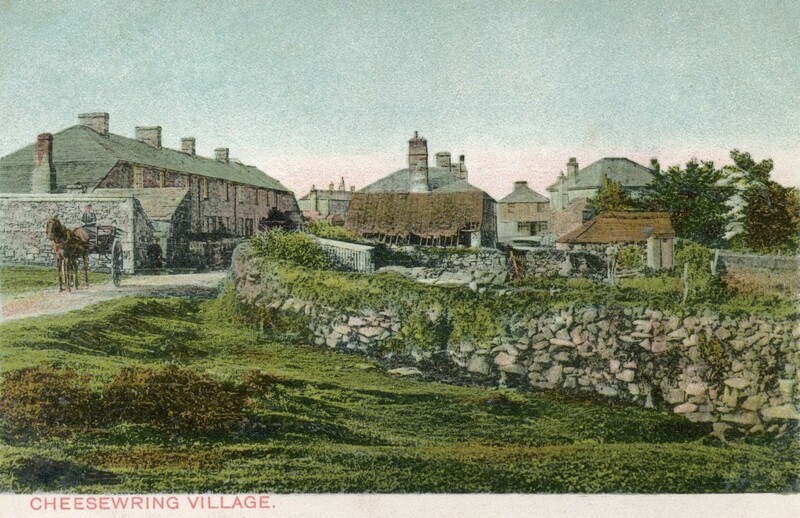 “CARADON TOWN.- There was anciently a chapel with a very fine Well standing; in the town place there is kept a manor pound to punish trespasses, and s0 much for the Manor of Carredon-lyer, High Rent is 1s.“-Harvey. This fine house, built by Mr. Dawe, referred to by Harvey was a few years later taken down and a new house built near its site by Mr. J. Trehane , where he then resided. There are the remains of an ancient cross at Northcoombe still to be seen. PENGELLY, which is 276 acres, appears to have been once the property of the Collyn family. The Will of “Wm. Collyn de Pengelly,” dated 20th April, 1608, is still extant; and in the time of Harvey part of Pengelly was in possession of John Foott. It was purchased of the late Francis Rodd, Esq., of Trebartha, by Richard Kittow, of Tredaule, Altarnun, by whom it was given to his nephew, Richard Kittow, also of Tredaule. He died intestate, and the property came to his only brother John Kitttow, of Browda. The name of these tenements is variously spelled- Lanhargie, Lanhargay, Lenhorgey, Lanhorgy, and the modern way, Lanhargy. It was formerly the property of a family of the same name. In 1901 Higher Lanhargy was the the property of Mr. William Maddaver, who resided there. It was purchased by him of the late F. Rodd, Esq., and was 156 acres. 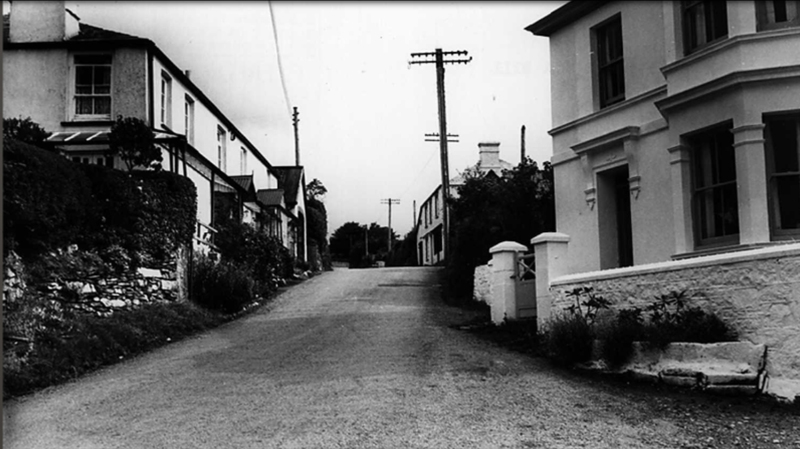 Lower Lanhargy was the property of Mr. B. S. Davey by succession and marriage, and contained 47 acres. “EXWELL.-‘Tis a very fine compact, entire estate, with a very fine dwelling-house, and convenient outhouses of all sorts. The dwelling place of Mr . Agnes Saltren;- the lands of her or her son.-all except a very small matter which belongs to the lords of Trefrise; for the land they pay yearly to the said lords 1d., and to each lord for conventionary rent 2d. It is valued in £ 44 a year. It is for the most part very good land;- lies very well; hath a helling stone quarry; a large town place, with very fine timber growing in it; with good meadows.“-Harvey. This estate of 119 acres was the property of Mr. Edmund T. Pearce. It has had a quick succession of proprietors,-the Saltrens, Madam Wills, Major Parsons, Thomas Robins, and John Thomas who sold it to Mrs. Saltren. 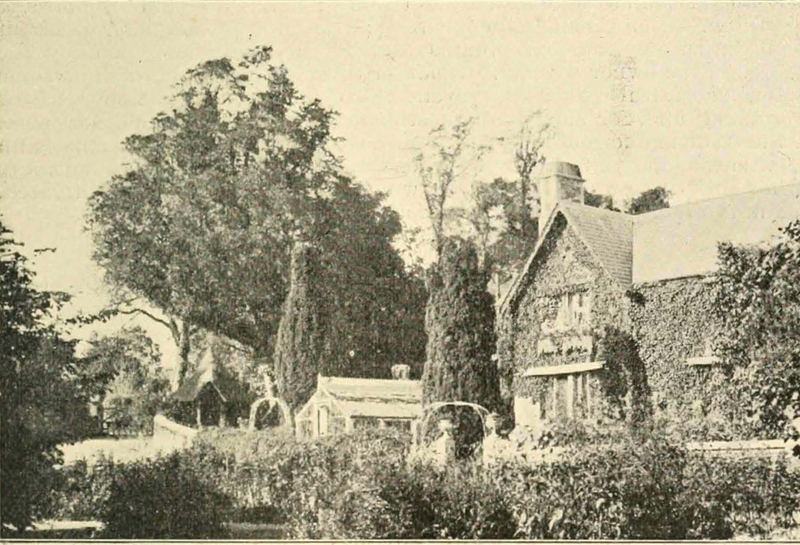 LOWER MILLCOMBE was the property of Thomas Kittow, but in 1901 belonged to John Kittow, Esq. ” The home stead of this excellent estate comprises two or three Seventeenth Century houses, once of some pretentions. On the carved stonework may still be seen the initial I.O. (John Oliver), and the date 1684.” Polsue’s Notes, 1876. Ted Gundry in conversation with Kitty Chanter-Menendez nee Henwood, who describes growing up on a farm at Linkinhorne. Ted Gundry in conversation with Barbara Hooper who talks about growing up near the Cheesewring, Minions and worked for Mr Piper of Phoenix, a stonemason. POST OFFICE, Linkinhorne.- Mis Heggaton, Sub-Postmistress. Letters through Callington R .S.O. arrive at 7-30 a.m.; despatched at 4-55 p .m. Rilla Mill is the nearest Money Order and Telegraph Office, Postal Orders are issued here, but not paid. POST & M. O. O. S . B. & Insurance, Annuity & Telegraph Office, Rilla Mill. Miss Mary Hobbs Sub-Postmistress . Letters through Callington R.S.O. arrive at 7-55 a .m. ; despatched at 4-30 p.m. This Office is als0 open for the sale of licences. POST OFFICE , Minions .- Miss H. Edwards, Sub-Postmistress. Letters through Liskeard arrive at 10 a.m. ; despatched at 3-35 p .m. Pensilva is the nearest Money Order and Telegraph Office. Postal Orders are issued here , but not paid. POST OFFICE , Upton Cross .- Arwin Crapp, Sub-Postmaster. Letters through Callington received at 9-0 a .m. ; despatched at 3 p.m. Wall Boxes: – Minions, cleared at 3-5 p.m.; Henwood, cleared at 12-30 p.m. daily, Sundays excepted; Upton, cleared at 3-55 p.m.; Patrieda, cleared at -10-30 p.m.; Plusha Bridge, cleared at 11 a.m.; and Darley, cleared at 1 p .m. A School Board of 7 members was formed February 19th, 1875; W. Grylls, Halfacre, Northill, clerk to the board ; William Truscott, Ley Mill, attendance officer. Board School, Upton Cross (mixed), built in 1876, for 439 children; average attendance, 66 boys and 85 girls and infants; William Charles Edwards, master. Board School (mixed), Sharplands, for 80 children ; average attendance, 72; C. Dalton, master. PRIVATE RESIDENTS. 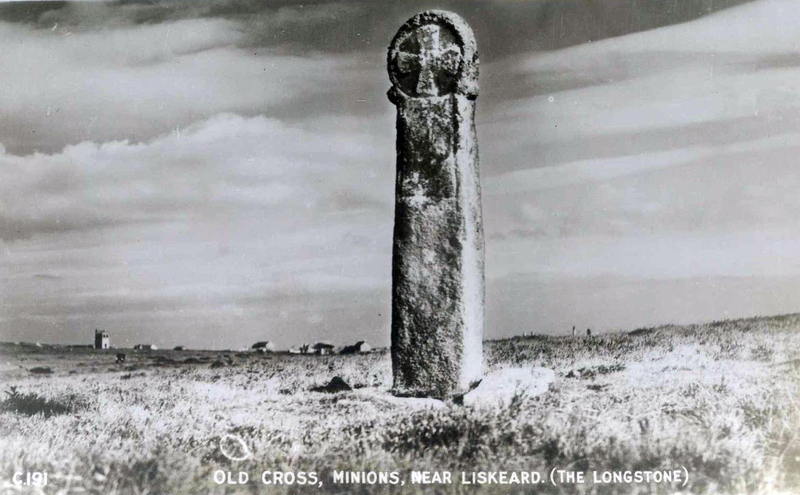 *Marked thus should be addressed Liskeard. Bosanquet Rev. C. C. C., Vicarage. 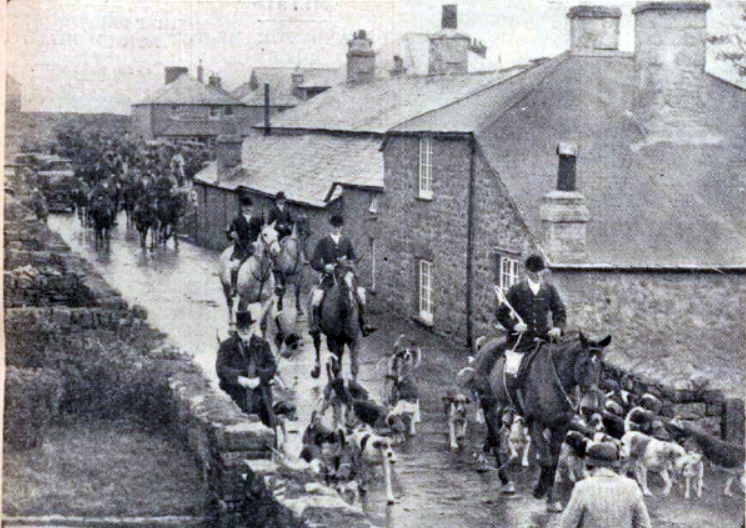 Dingle, J . W., E q., J.P., C.A., North Darley. *Gill, J. Wm. 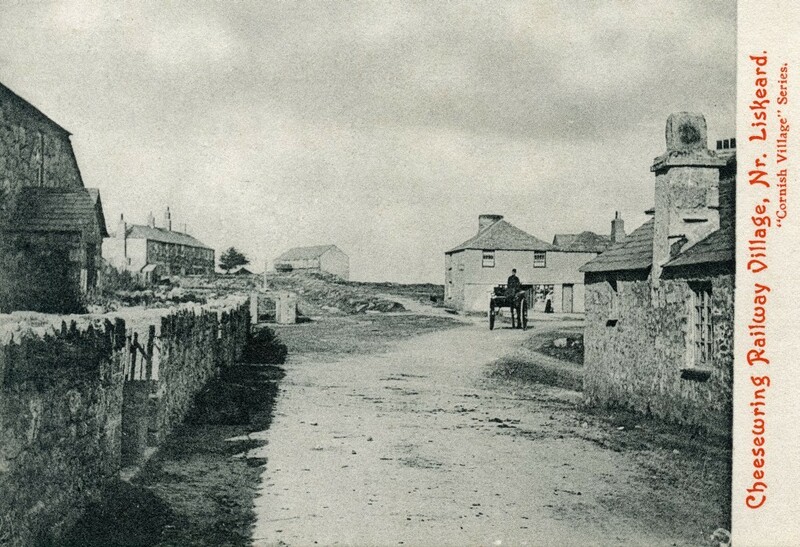 , E q ., Downgate, Liskeard. Kitttow, John, Esq. , Browda. Kittow, Mr ., Patrida. Stephens, J. , Longridge Cottage. Sargent, Joseph, Bray Shop. Trehane, John, North Coombe. Abbott, W., carrier, Liverscombe. 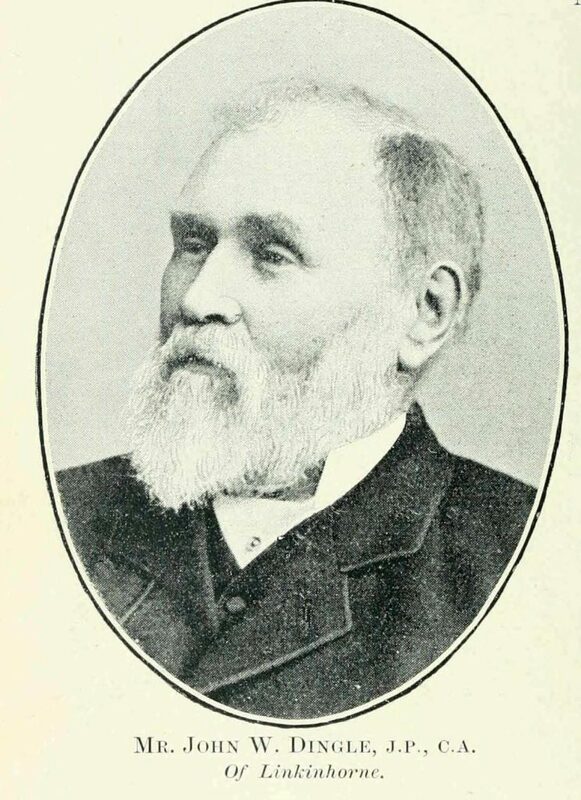 Abbott A. smith, Rillaton. Ball, Wm., miller, Dwella Mill. Bartlet , F. , wheelwright, etc. 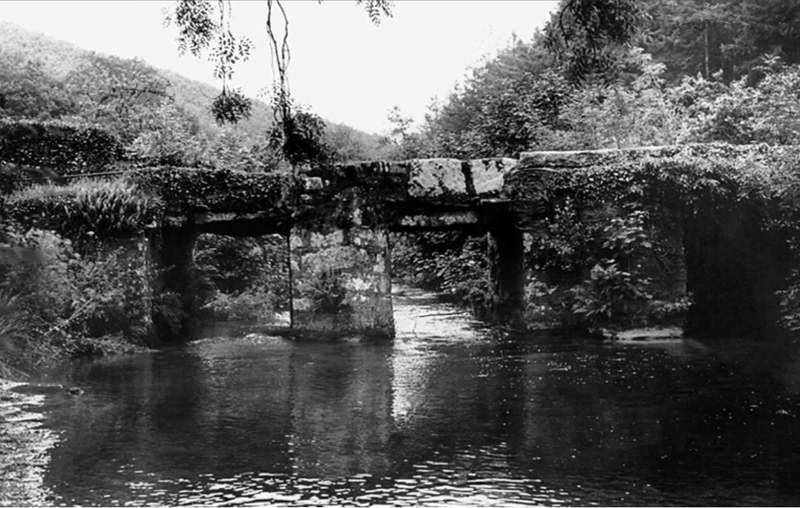 ,PIusha Bridge. Burrows , R. , New Inn, Churchtown. Carkeet, G. , assistant overseer & Clerk to P. Council, Ley Mill. Chapman, J ., carrier & Posting establishment , Upton Cross. Coom , R. , carrier, Henwood. Crapp, Arwin, Post office, Upton Cross. *Chapman, Ellen , shopkeeper Railway. Davey G. , carpenter , Darleyford. Daw, J., Manorhouse Inn, Rilla Mill. *Debble , Joel , Commercial Inn, Downgate. *Edwards,H. postmistress Railway. *Freeman, J. , Sons, Cheesewring quarry owner. Gill , W. J. surgeon, Downgate, Liskeard. Gourd, M., bootmaker, Christa. Gerry, W. , merchant, Henwood. *Gerry , John, Railway Hotel, Cheesewring. Hobbs, Mi s Mary, shopkeeper, Post Office, Rilla Mill. Hobbs, J. D. builder , Rilla Mill. Hubber, Elizabeth, grocer. Martin, J. L. , market gardener, Starabridge. Martin, R. B. butcher , Uphill. Nankivel, Edward, Caradon Hotel. Nicolls, Eliz., shopkeeper, Uphill. Pomroy J., smith, Upton Cross. Robinson, R., miller Addicroft Mill. Shovell, E., shopkeeper, Upton Cross. Stephen, Jonathan carpenter, Plushays. Truscott, A., miller etc., Rillan Mill. Truscott, W., attendance officer, Ley Mill. Vosper, Thos., Smith, Brayshop. William, J., tin streamer Phoenix Mine. Warne, J., tailor, Newhouse. Williams, Charles, shopkeeper, Railway. Cheesewring contructed by Gilkes Wilson & Co in 1864 for the Liskeard & Caradon Railway,it was later rebuilt at Swindon in 1907 and became GWR 1311 two years later and moved to London. 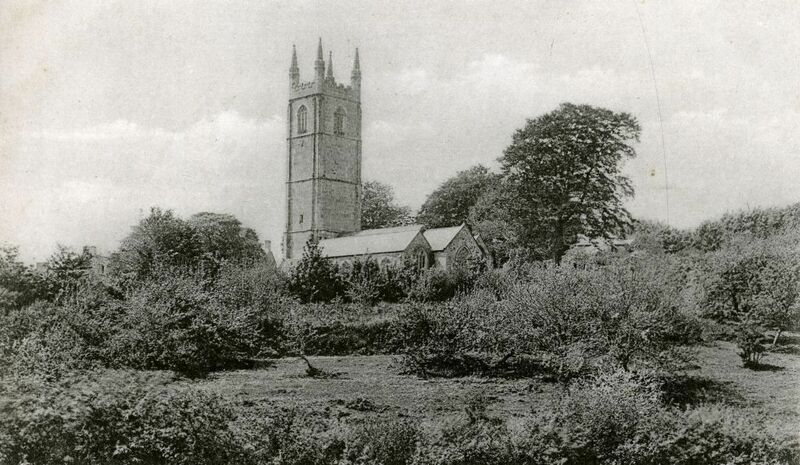 St Melor Church, Linkinhorne 1910. Armytage was born in 1894 at Lowdham, Nottinghamshire to the Revd Claude Charles Courthope Bosanquet and Millicent Percy (nee Percy-Smith). He was educated at St Mary’s Hill School, Horsall near Woking in Surrey, and Lancing College, where he won an Exhibition and was in Olds House from September 1907 to July 1912. While at school he excelled at marksmanship and distinguished himself at Bisley on more than one occasion. He was in the Shooting VIII from 1909 to 1912. In July 1909 he was one of the pair which won the Bronze medal for the Cadet Trophy, and was Captain of the Shooting VII in 1911 and 1912. He was a Sergeant in the Officer Training Corps and was appointed as a Prefect in 1911. He went on to Christ Church College Oxford and had finished his second year there when war broke out. He was commissioned as a 2nd Lieutenant in the Special Reserve of Officers in 3rd Battalion Duke of Cornwall’s Light Infantry on 4 September 1912, and promoted to Lieutenant in February 1915 which was antedated to April 1914. On 2 November 1914 he landed in France, where he was attached to 1st Battalion of his regiment and was promoted to Captain in May 1915. He returned from France in August 1915, and after a period of home service was attached to the Wiltshire Regiment and went to Mesopotamia in November of that year. He was mentioned in Dispatches twice and was awarded the Military Cross in 1916. His Majesty the KING has been graciously pleased to approve of the undermentioned Honours and Rewards for distinguished service in the Field in Mesopotamia, with the effect from 3rd June, 1916 inclusive:–Awarded the Military Cross. “He was shot through the head when leading an attack on the German trenches on the morning of 25th January. He had covered about half the distance when he was struck, and in another two minutes would have been in this position. Although we took heavy toll – this regiment alone accounted for two hundred and fifty Turks killed – it does not make up for our loss. John was born in 1886 at Pensilva. He married Maude Hambly. He joined the Royal Navy as a able seaman (Service No. R/269) but due to the need for manpower on the battlefield he was placed in the Nelson Battalion of the Royal Navy Division. He died of his wounds sustained in battle on the 15th October, 1917, at the 47th Casualty Clearing Station. He was interred at the Dozinghem Military Cemetery, Belgium. Fred was born in 1876 at Linkinhorne to William John and Catherine (nee Vincent) Eddy. He married Emily Manley and in 1891 was living in Redruth working as a miner in a tin mine. By 1901 had joined the Royal Navy. Fred enlisted at Redruth with the Royal Engineers as a Lance Corporal (Regimental No. 121843) serving with the 183rd Tunnelling Company (on the Linkinhorne War Memorial he is shown as a Private with the Duke of Cornwall’s Light Infantry). He was killed in action on the 1st December, 1915, at Flanders and was interred at the Citadel New Military Cemetery. William was born in 1895 at Minions. One of his parents was J. Hooper. William enlisted with the Hampshire Regiment (Regimental No. 11831) as a private serving with the 14th Battalion. He died on the 4th September, 1916 and was interred at the Couin British Cemetery. William was born in 1888 at Linkinhorne to William Hooper. The family lived at Sharptor. He first enlisted with the Somerset Light Infantry (Regimental No.22322) but was later transferred to the Duke of Cornwall’s Light Infantry (Regimental No. 27571) as a private serving with the 1st Battalion. He was killed in action on the 4th October, 1917. His body was never recovered but his name is commemorated on the Tyne Cott Memorial. Fred was born in 1887 at Lezant to William and Mary Jasper. He joined the Devonshire Regiment serving in the 9th (Service) Battalion as a private (Regimental No.45757). Fred was Killed in Action at Polygone Wood/Judge Copse Flanders on the 9 Oct 1917 ? Samuel was born in 1890 to Joseph and Mary Jane Penny. He enlisted with the Duke of Cornwall’s Light Infantry as a private (Regimental No. 35058). He died on the 26th December, 1918, at Exeter and was interred in the Exeter Higher Cemetery. At the time of his death, his parents were living at Darley. 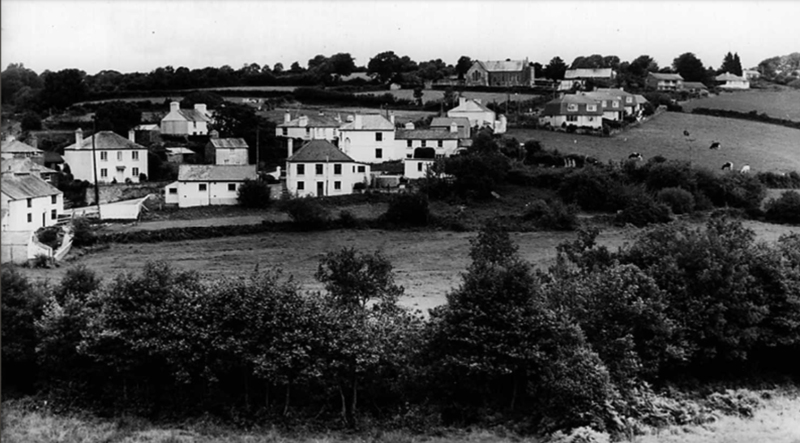 Sydney was born in 1895 at Trewinnoe Farm, Lewannick to John Henry and Hannah Perry. It appears that he could have been orphaned as he was living with Francis and Susan Mitchell at Millpool fram, Linkinhorne from the age of 5 onwards. He enlisted with the Duke of Cornwall’s Light Infantry as a Private (Regimental No. 17268) serving with the 1st Battalion. He died of his wounds sustained in battle on the 21st of July 1916 at the age of 21. He was interred at the Heilly Station Cemetery. James was born in 1898 at Linkinhorne to Robert and Eliza Robinson. He enlisted with the Machine Gun Corps (Regimental No. 66686) as a private serving with the 8th Company. He was killed on the 3rd February, 1917 at Flanders. He was interred at the Etaples Military Cemetery. George was born in 1883 at Botternell Farm, North Hill, to James and Mary Sargent. He emigrated to Canada where he enlisted with the Royal Naval Canadian Volunteer Reserve serving aboard the ‘HMCS Niobe’ as an Engine Room Artificer 4th Class (Service No. VR/ 772). He contracted pneumonia and died on the 23rd January, 1919. He was interred at the Halifax (St Johns) Cemetery. Thomas was born at Upton Cross in 1884 to Ellen and Thomas Shovel. His father was a grocer and Chairman of the Liskeard Union Board of Guardians and Thomas was destined to become a Wesleyan minister. Thomas was ordained into the Ministry in July 1912. A notice in the times dated October 15th 1918 states that at the outbreak of war in 1914 Thomas had tried to enlist as a chaplain, but was not accepted. 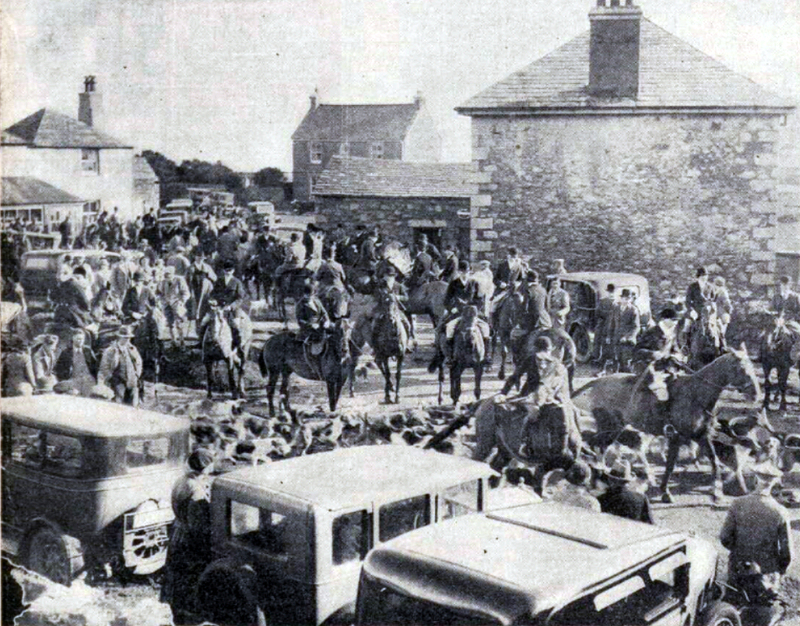 Instead, he carried on his ministry working at the English Wesleyan Methodist Chapel in Holyhead, he then served two years at Bamber Bridge Methodist before later being accepted into the Royal Army Chaplains Department, and shipped to France in January 1918 as an Army Chaplain 4th Class, with equivalent rank of Captain. Thomas was attached to the 2/2nd Wessex Field Ambulance regiment and served on the Western Front, for which he received the princely sum of 10 shillings a day for his work. His main role would have been to offer comfort and say prayers for the wounded, and ultimately minister the last rites to the dying. On the 5th or 6th of October 1918 whilst out walking with a medical officer of the field ambulance he was badly wounded by shrapnel and subsequently died. Thomas was buried at Louverval Military Cemetery in Doignies, France. Reginald was born in 1915 at Devonport, Plymouth, to Edward Henry and Grace Laura Bleakman. He joined the Royal Navy as a leading seaman (Service No. D/SSX 15091). He was serving aboard ‘HMS Tartar’ when he was one of four killed during enemy action on 9th June, 1944. On 9 June HMS Tartar and the flotilla were in action against German warships. Though the German destroyers ZH1 and Z32 were sunk, Tartar was damaged by return fire. Her galley and bridge were hit and set on fire. Four men were killed and twelve wounded including Commander Jones. Her foremast hung over the side and all of the radar and communications were dead. She returned to Devonport briefly to undergo temporary repairs, before resuming operations in the English Channel. On 7 July she intercepted and engaged minesweepers of the 46th German Flotilla off the Channel Islands and sank the minesweepers M4601 and M4605. 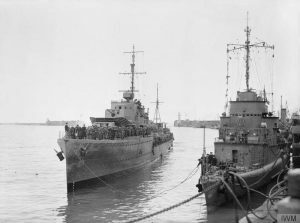 On 6 August Bellona, Tartar, Ashanti and the Canadian destroyers Haida and Iroquois attacked a convoy off Saint-Nazaire, sinking the minesweepers M263 and M486, the patrol boat V414 and a coastal launch together with four small ships. He was interred at Upton Cross (St Paul) Churchyard where he had lived with his wife Josephine Mary. John was born in 1896 to William Henry and Susan Ann Brown. He enlisted with the Royal Engineers (Regimental No. 1921770) as a lance corporal serving with the 853 Bomb Disposal Company. He died on the 5th November, 1940 and was interred He was interred at Upton Cross (St Paul) Churchyard where he had lived with his wife Beatrice Maud Brown. Norman was born in 1914 to Sidney Charles and Mahala (nee Sambells) Dawe. He enlisted with the Royal Armoured Corps (Regimental No. 5438114) as a Trooper serving with the 45th Regiment. He was killed whilst in India on the 26th September, 1943, and was interred at the Kirkee War Cemetery, India. His brother, William (below), also fell serving in the war. William was born in 1919 at Linkinhorne to Sidney Charles and Mahala (nee Sambells) Dawe. He was serving in Palestine with the Palestine Police Force (Service No. 1726) as a constable when he died on the 13th April, 1944. He was interred at the Jerusalem Protestant Cemetery, Israel, Plot F. Grave 24. Alfred was born in 1904 at Bristol to William Henry and Emma Eddy. He joined the Royal Navy (Service No. D/K 65828) as petty officer stoker. Alfred was serving aboard ‘HMS Havant‘ when she was aiding the Dunkirk evacuation on the 1st June, 1940 . The Havant was badly damaged by Junkers Ju 87 Stuka dive bombers and had to be scuttled. Eight crewmen, including Alfred, were killed and 25 were wounded in the attack. At least 25 soldiers were also killed. Alfred’s body was never recovered but his name is commemorated on the Plymouth Naval Memorial. He left a widow, Alexandra Louisa Eddy, who was living at Higher Stanbear, Callington. Harold was born in 1914 at Liskeard to Harry and Elizabeth Edwards. He joined the Royal Navy (Service No. 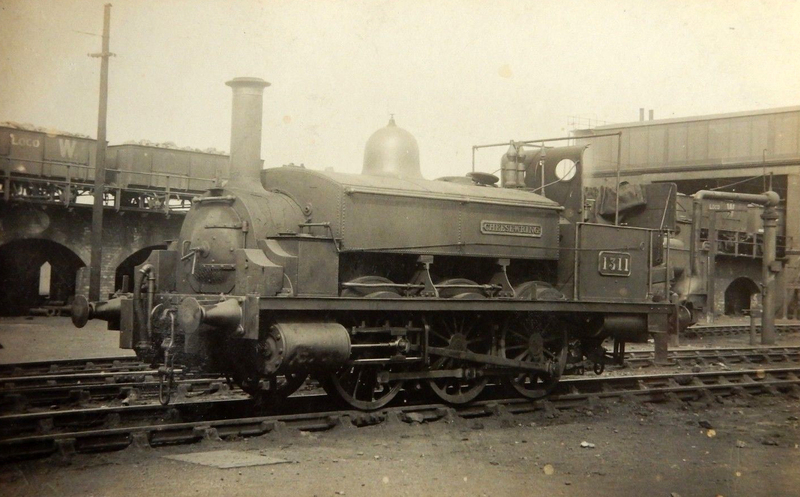 D/KX 85743) as a leading stoker. Harold was serving aboard the submarine ‘HMS/M P 32’ when she struck a mine off the coast of Italy on the 23rd August, 1941 and sunk killing all but two of the crew. 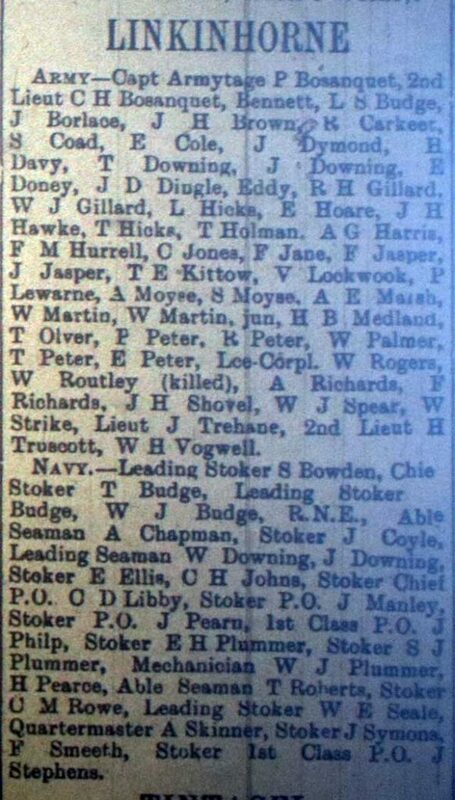 Harold’s body was never recovered but his name is commemorated on the National Submariners’ Memorial in London. Harold left a widow Dorothy Sleeman Edwards who was living at Linkinhorne at the time of his death. HMS P32 was a Royal Navy U-class submarine built by Vickers-Armstrong at Barrow-in-Furness. The submarine left Malta on 12 August 1941 for a patrol area near Tripoli. Six days later, she sighted a small Italian convoy of five merchant ships protected by destroyers and torpedo boats heading towards the port. P32 and two other U-class submarines attempted to attack the convoy. HMS P33 was almost certainly sunk in the attempt, whilst HMS Unique managed to sink an Italian merchant ship, SS Esperia two days later. P32 was not in a good position to make an attack, and so attempted to improve it by running underneath a moored minefield. Believing that she had cleared the minefield, the commanding officer, Lieutenant D.A.B. Abdy ordered the submarine to rise to periscope depth to resume the attack. A mine, either part of the minefield, or laid by an allied aircraft, exploded against her port side and flooded the portion of the boat forward of the control room, killing the eight crew members in that part of the vessel. The submarine developed a severe list and sank to the seabed. Most of the 24 survivors retired to the engine room to attempt a DSEA escape. However Abdy, the coxswain, Petty Officer Kirk, and ERA Martin attempted to escape using the conning tower. Martin was killed in the attempt but the other two men survived and were picked up by an Italian ship. No other crew members survived. Abdy and Kirk were exchanged for Italian prisoners of war in 1943. The wreck was discovered in 1999; it lies about 15 nautical miles east-north-east of Tripoli, at a depth of about 200 feet. Frederick was born in 1920 in Cornwall to Morris and Dorothy (nee Rickard) Finch. He joined the Hampshire Regiment (Regimental No. 5441948) serving as a private with the 2nd/4th Battalion. He was probably involved in the battle for the Gothic Line in Italy that ran from the 24th August 1944 to the 23rd September 1944, when he was killed in action on the 22nd September, 1944. He was interred at the Coriano Ridge War Cemetery, Italy. James was born in 1920 at St. Germans. He married Gladys Mary Plummer. He joined the Royal Navy (Service No. D/JX 145641) serving as a petty officer aboard HM Motor Torpedoe Boat 667. It was on this boat that he was killed by accidental methyl bromide poisoning on the 5th March, 1943. He was interred at the Upton Cross (St Paul) Churchyard. John was born in 1921 to Digory Edward and Helen Moncrieff (nee Jones) Kittow. He enlisted with the Devonshire Regiment (Regimental No. 184467) serving as a Lieutenant with the 12th (6th Airborne division) Battalion. He was seriously wounded during the Battle for Breville, soon dying from these wounds on the 12th June, 1944. The War Diary for the 6th AL Brigade tells of Lt. Kittow’s death during the Battle. He was interred at the Ranville War Cemetery, Calvados, France. There is little information on R. Lockwood other than he was a Able Seaman with the Merchant Navy. George was born in 1916 at Minions to William George and Emma Jane Mead. He joined the Royal Navy (Service No. D/KX 92997) as a stoker first class. He was serving aboard ‘HMS Courageous’ when on the evening of the 17th September, 1939, she was on patrol off the coast of Ireland. Two of her four escorting destroyers had been sent to help a merchant ship under attack and all her aircraft had returned from patrols. During this time, Courageous was stalked for over two hours by U-29, commanded by Captain-Lieutenant Otto Schuhart. The carrier then turned into the wind to launch her aircraft. This put the ship right across the bow of the submarine, which fired three torpedoes. Two of the torpedoes struck the ship on her port side before any aircraft took off, knocking out all electrical power, and she capsized and sank in 20 minutes with the loss of 519 of her crew, including George. The survivors were rescued by the Dutch ocean liner Veendam and the British freighter Collingworth. His body was never recovered but his name is commemorated on the Plymouth Naval Memorial. 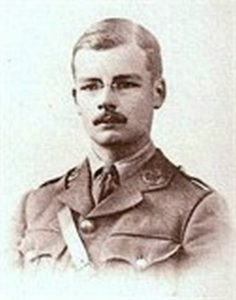 His brother Stanley Frederick Mead (below) also fell. Stanley was born in 1906 at Devonport, Plymouth to William George and Emma Jane Mead. He joined the Royal Navy (Service No. D/K 63834) as a petty officer stoker. He was serving aboard ‘HMS Repulse‘ when the ship was sunk by bombing and torpedoes off Malaya with the loss of 508 officers and men. Stanley’s body was never recovered but his name is commemorated on the Plymouth Naval Memorial. He left a widow, Marjorie, who at the time of his death was living in Minions. Cyril was born in 1920 to Edwin Albert and Mabel Alice Northcott. He joined the Royal Air Force Volunteer Reserve (Service No. 1194655) as a sergeant flying with 149 Squadron. On the night of 15th November, 1941, Cyril and the crew of R1627 left RAF Mildenhall at around 17:30 hours in their Wellington bomber for a mission over Emden. A total of 49 aircraft took part in the operation with 4 being lost, including R1627, which was believed to have come down somewhere in the North Sea. None of the crew’s bodies were ever recovered but Cyril’s name is commemorated on the Runnymede and RAF Memorial’s. 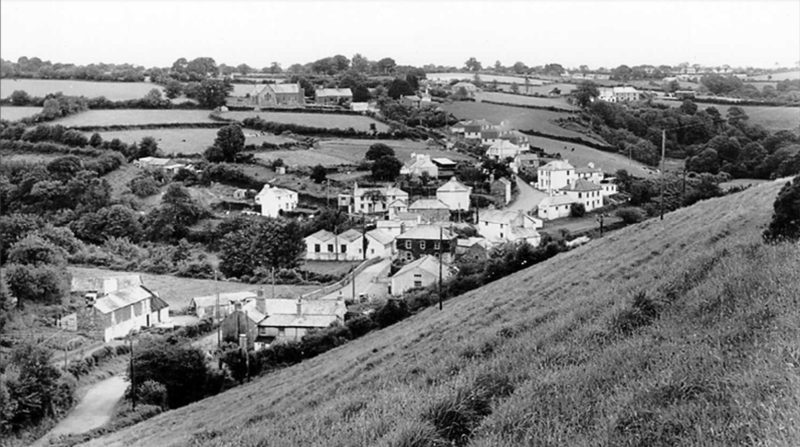 Herbert was born in 1919 at Liskeard to George Haughton and Blanche Peters. He joined the Royal Navy (Service No. D/KX 90165) and was serving as a leading stoker aboard ‘HMS Diamond,’ when, on 27 Apr 1941 she was sunk by German aircraft whilst evacuating Allied troops from Greece. He was interred at the Phaleron War Cemetery, Greece. Near the mouth of the Argolic Gulf a Staffel of nine Luftwaffe Junkers Ju 87 Stuka dive-bombers from Jagdgeschwader 77 attacked the convoy at either 06:45 or 07:15. Slamat was hit, set afire and began to abandon ship. Calcutta ordered Diamond to go alongside Slamat to rescue survivors while the rest of the convoy continued to try to reach Souda Bay in Crete. At 08:15 Diamond reported that she was still rescuing survivors and still under air attack. By then three destroyers had reinforced the convoy so Calcutta sent one of them, HMS Wryneck, to assist Diamond. Slamat was afire from stem to stern when Diamond fired a torpedo that sank her in a coup de grâce.Diamond reported at 09:25 that she had rescued most of the survivors and was proceeding to Souda Bay. An hour later Wryneck signalled a request for aircraft cover. At about 13:15, an air attack by German Messerschmitt Bf 109 fighters and Junkers Ju 88 bomberssank both destroyers within minutes. Wryneck launched her whaler, and each destroyer launched her three Carley floats. Survivors in the whaler set off east past Cape Maleas, towing two Carley floats and their occupants. In the evening the wind increased, causing the floats to strike the boat, so Waldron reluctantly cast them adrift. After 1900 hrs on 27 April the Vice Admiral, Light Forces, Henry Pridham-Wippell, became concerned that Diamond had not returned to Souda Bay and was not answering radio signals. Wryneck had been ordered to keep radio silence so no attempt was made to radio her.Pridham-Wippell sent the destroyer HMS Griffin to the position where Slamat had been lost. She found 14 survivors in two Carley floats that night, more floats and another four survivors in the morning, and took the survivors to Crete. The last living survivor from Slamat, Royal Army Service Corps veteran George Dexter, states that after Wryneck was sunk he and three other men were rescued by the cruiser HMS Orion. Survivors in Wryneck’s whaler reached Crete in three stages. On 28 April they aimed for the island of Milos in the Aegean Sea, but were too exhausted so they landed at Ananes Rock, about 13 nautical miles (24 km) southeast of Milos. There they met a caïque full of Greek refugees and British soldiers evacuated from Piraeus, who were sheltering by day and sailing only by night to avoid detection. In the evening everyone left Ananes and headed south for Crete, with most people in the caïque and five being towed in the whaler. On 29 April the caïque sighted a small landing craft that had left Porto Rafti near Athens. She took aboard everyone from the caïque and whaler, and the next day they reached Souda Bay. Clarence was born in 1918 at Tavistock to Thomas and Evelyn Annie Roberts. He joined the Royal Navy (Service No. D/JX 139144) and was serving as a leading seaman aboard ‘HMS Punjabi,’ when, as part of Convoy PQ-15, she was involved in a collision with the battleship ‘HMS King George V‘ and sunk off the coast of Iceland. While steaming in formation in heavy fog, the lookout on Punjabi reported what he believed to be a mine dead ahead; the captain reflexively (and regrettably) ordered a 15-point emergency turn to port; in so doing, she sailed directly into the path of King George V and was sliced in two by the battleship’s bow. 169 of the ship’s company were rescued from the forward section, and another 40 were picked up from the sea by other escorts, including Marne. Those crew left in the aft section, which sank very quickly, were killed when her depth charges detonated; 49 of her crew lost their lives in the accident. She sank directly in the path of the US battleship USS Washington, which had to sail between the halves of the sinking destroyer. Washington suffered slight damage from the detonation of the depth charges. King George V sustained serious damage to her bow, and was forced to return to port for repairs. Further investigation revealed no mines in the area, or indeed in any part of the convoy’s eventual path. It is unknown what the lookout actually spotted, if anything. Clarence was one of the crew killed in the incident and his body was never recovered but his name is commemorated on the Plymouth Naval Memorial and his parents grave in Upton Cross (St Paul) Churchyard. Mary was born in 1922 to Leslie Owen and Edith Mary Shovel. She joined the Auxiliary Territorial Service (Service No. W/ 288464) s a private. She died in London on the 9th July, 1944. She was interred at the Rilla Mill Methodist Chapelyard. With thanks to the www.cornwallswarhistory.co.uk and wikipedia.org websites.